At a press conference held at the Montreal International Auto Show, the Automobile Journalists Association of Canada (AJAC) handed the award for Best New Innovation Technology for 2017 to Mazda for its G‑Vectoring Control. Mazda's SKYACTIV‑G 2.5T engine with Dynamic Pressure Turbo was also chosen as a finalist for the award. Starting with the recently introduced 2017 Mazda6 and Mazda3, Mazda introduced a series of new‑generation vehicle motion control technologies called SKYACTIV‑VEHICLE DYNAMICS. This series of technologies enhance the driving experience by providing integrated control over the engine, transmission, body and chassis. The first technology of the SKYACTIV‑VEHICLE DYNAMICS series is G‑Vectoring Control, or GVC. In a nutshell, GVC is a technology that uses the engine to enhance chassis performance. GVC adjusts engine torque in response to steering action, delivering unified control over longitudinal and latitudinal acceleration forces. Optimizing loading for maximum grip from each tire means the car moves more precisely as the driver intends, reducing the need for steering corrections, including many that the driver is not even aware of. On slippery road surfaces, steering response and handling stability are improved, giving drivers more confidence. Even when driving straight ahead, the car follows the driver's intended path with far fewer steering corrections. Also, GVC makes the changes in acceleration forces acting on the people in the car smoother, which reduces head and torso sway. Of course, this means a more comfortable and enjoyable drive. "Our Mazda engineers have an obsession with the perfection of driving dynamics for our vehicles, and they invested a lot of time and effort into developing this technology, which is possible only because of the advancements made by SKYACTIV Technology," said Rob Murdoch, National Manager, Technical Services, Mazda Canada. 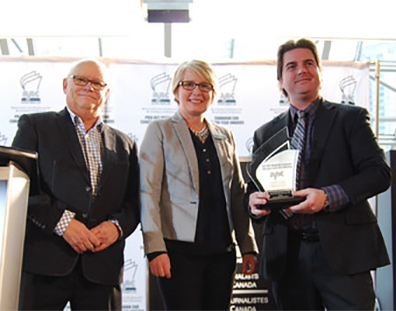 "GVC is just another example of the passion for driving that runs through our veins, and we're honoured to receive this award." The AJAC Best New Technology awards are voted on by a panel of 12 automotive journalists who are all experts in vehicle technology. "What impressed us the most was just how marvelously clever the concept behind Mazda's G‑Vectoring Control really is, for a technology that can have such a positive impact on the driving dynamics of a vehicle," said Marc Lachapelle, AJAC Technology Panel Judge. "Simple yet powerful engineering ideas like this are how a small independent carmaker like Mazda can stand out, and that's what makes this a true winner." G‑Vectoring Control is included as standard equipment in the 2017 Mazda3 and 2017 Mazda6, and will be integrated into the full Mazda lineup as updates are made in future models.